Sleeps 6 - 2 Doubles, 2 Singles, Cot supplied on request. This beautifully furnished property is situated in the heart of Keel, close to all amenities. walking distance to beach with stunning views of Minaun Cliffs. 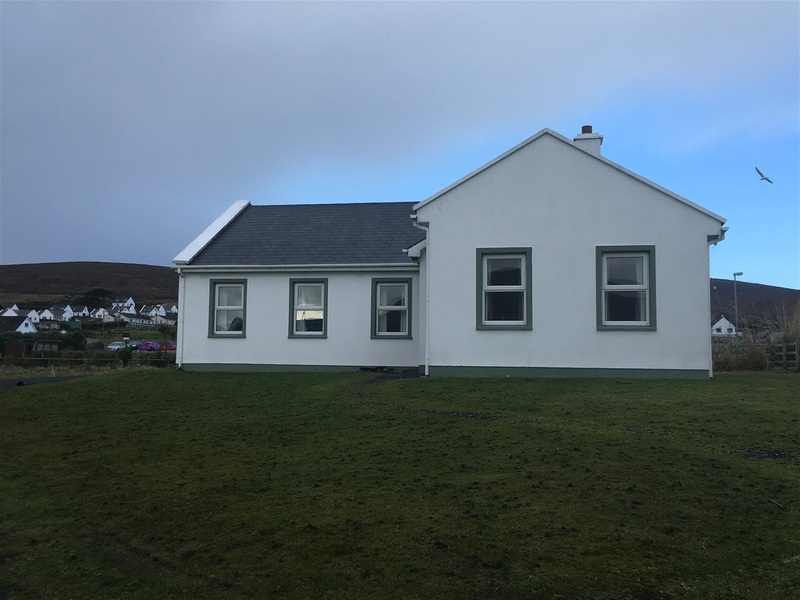 House consists of 1 bathroom, 1 ensuite shower room & a wc off a spacious utility room. Open fire, Television with saor view. Large open Kitchen/Diner. Set on large garden area with boundry fence. Electricity is metered and charged seperatly. 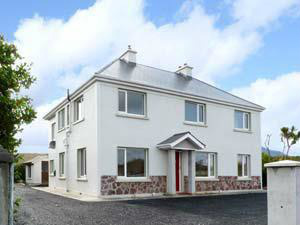 This beautiful newly renovated home is located in Bunnacurry village on the main road in the centre of the Island. 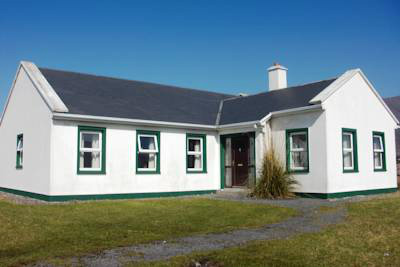 It is located 4 miles from Achill Sound and 3 miles from Keel. View from front of the house is Fintan Bay and from rear is the breathtaking mountain of Minaun Heights. The house is very cozy and spacious and sleeps 14 people very comfortably, there is private off road parking inside the gate. Large Living/Dining/Kitchen area opening into a conservatory which opens onto a patio area for outdoor living, dining, etc. Bed Linen is supplied but you should bring your own towels. TRANQUILITY. 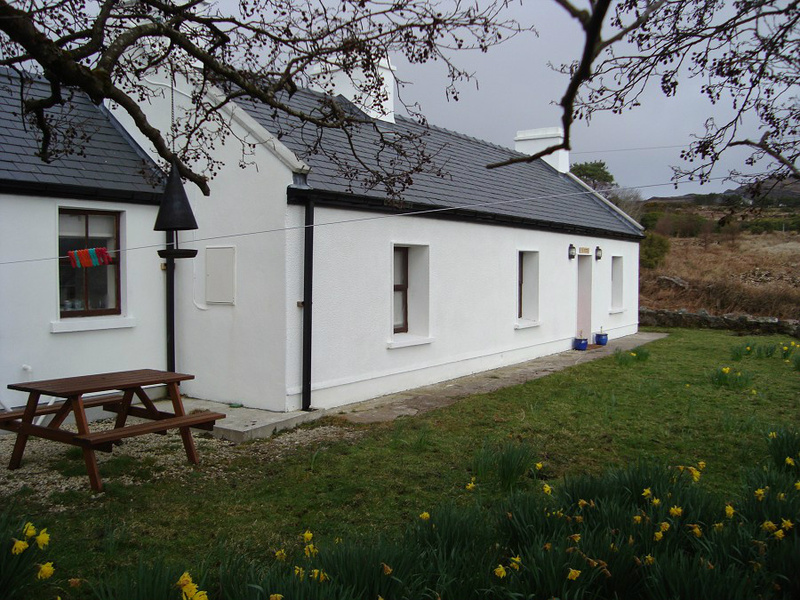 FOUR STAR FAILTE IRELAND APPROVED COTTAGE. Electricity & Oil are charged seperatly. No. 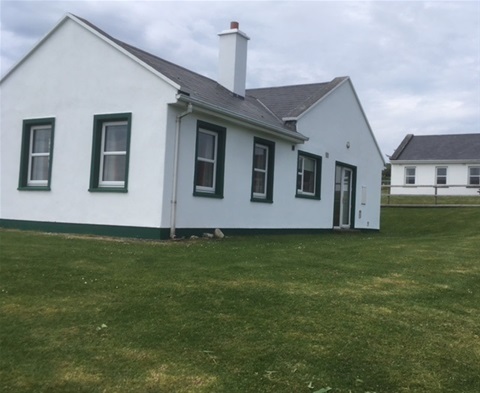 4 Trawmore Cottages, Keel. 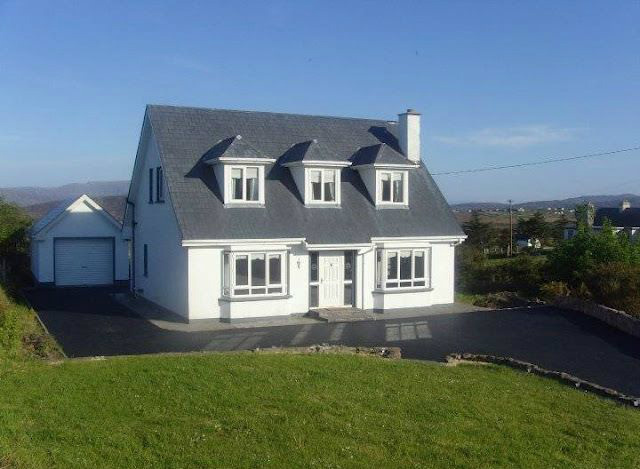 Englmer Cottage is a large family home situated in the village of Bunnacurry. Beautiful views and large front and rear gardens with a bank at the rear sloping down to a small stream. 1 Master bedroom (King size Bed - 6 ft) with sea view. 1 double room (5 ft bed) with mountain/garden view. 1 double room (4ft bed) with sea view. 1 twin bedded room (2 x 3ft beds) with mountain/garden view. Lounge with open original stone fire place (not currently in use)and character features including restored stone walling and stairs to mezzanine level with additional seating area. 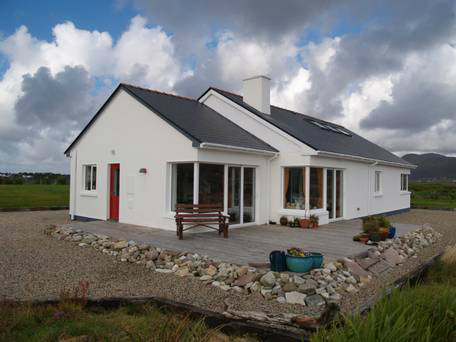 Sleeps 10 - 2 Doubles, 3 Twins. Only a few hundred metres from the shore, Achill Shore View is nestled on a quiet, private lane off the spectacular Atlantic Drive. The house lies in a haven of tranquility – you rarely hear traffic noise – with all the amenities for an adventurous, exciting and entertaining holiday very close by. 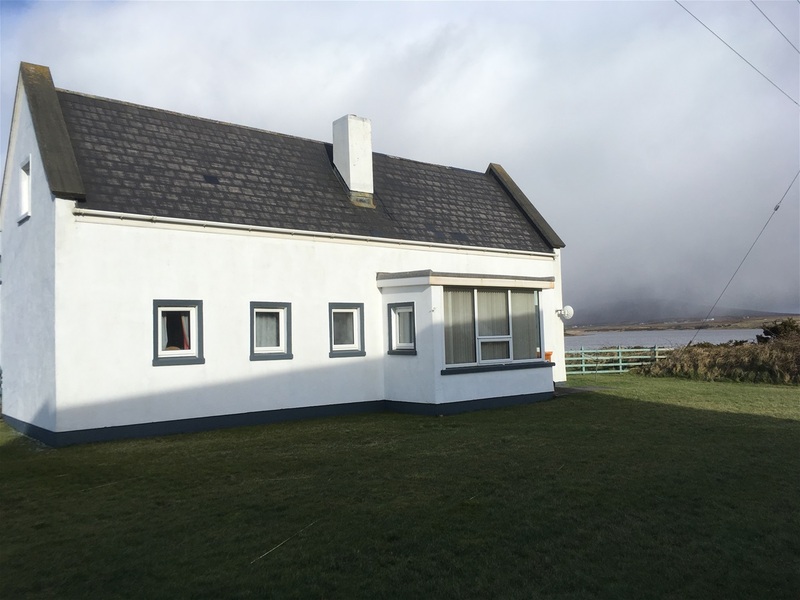 A short distance from Achill Sound’s shops, pubs, supermarket and Catholic church, Achill Sound is also where the very popular Great Western Greenway Cycle and walking path begins and can be followed to the busy town of Westport. On entering this delightful architecturally designed home you will be wowed by the wonderful spaciousness created with cathedral ceilings and a clever open-plan layout. This unique house boasts spectacular views on all sides and has a way of lulling people into deep relaxation. The main living areas of kitchen, dining room and living room are open-plan. The kitchen is fully equipped with a large double sink, dishwasher, fridge/freezer, plenty of storage and a semi-professional Rangemaster cooker with seven gas rings, a grill and two electric ovens. A large separate utility room has both a washing machine and a tumble dryer. There is also a utility sink. Both dining room and living room have double height ceilings and wrap-around windows facing onto the large decking area. The dining room and kitchen have doors onto the decking. There are two double rooms (one with super-king bed) and two twin rooms on the ground floor with the master bedroom having an en-suite walk-in shower room. The ground floor bathroom has a power shower and Jacuzzi bath. Upstairs is another bathroom with an insulated deep Japanese soaking bath – large enough for two – and is ideal for salt or seaweed soaks as the water maintains its temperature for a long time. The large bright attic room can be used for additional living or sleeping space and has a sofa and two comfortable single trundle beds with full size regular mattresses. 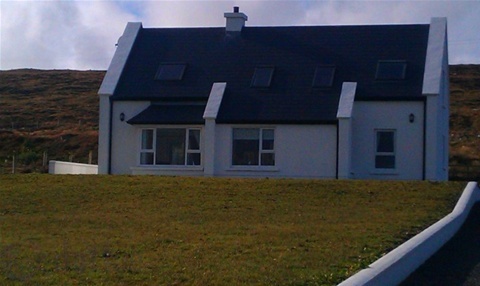 PETS ARE ALLOWED at Achill Shore View, provided they are properly house-trained. To the west of the garden adjacent to the garage is a large secure dog run with a kennel. This dog run is visible from the kitchen, dining room and lounge. Pets are welcome indoors in the common areas but MOST DEFINITELY NOT in bedrooms. Bed Linnen and Towels supplied. Electricity and oil is metered and charged seperatly.